I hunt all public lands whether I’m hunting in Utah or New Mexico. 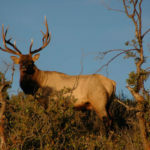 I’ve taken the most and biggest elk in the Gila National Forest (http://www.stateparks.com/gila.html) – a huge area. 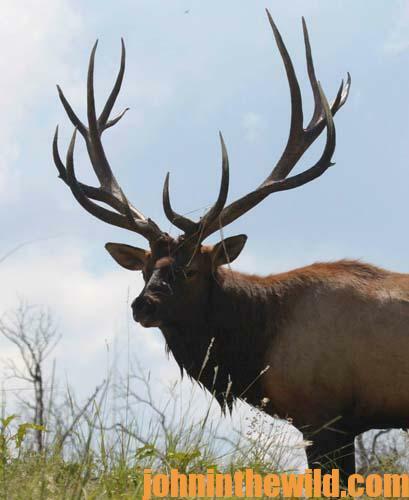 The elk in that portion of New Mexico have great genetics that produce really-big bulls. 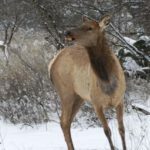 The elk in the Gila also have really-good habitat, and because the area is so big, they have great places to hide, feed and breed to grow to the older-age classes and put on massive horns. There are only two ways to hunt the Gila – on horseback or by hiking in on foot. 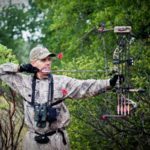 The secret to hunting and finding older-age-class bulls is to hunt what we call, the no-man zone. 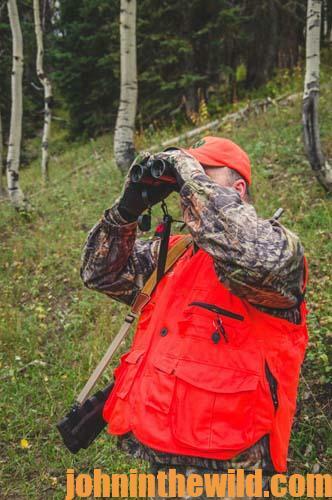 The hunters who pack in on horseback want to go deep in the wilderness area to hunt, and the hunters who hike in usually won’t walk for more than 1-2 miles at the most. So, the areas between where the horseback hunters hunt and the hiking hunters hunt is generally where we hunt the most, because that no-man land tends to receive the least amount of hunting pressure. 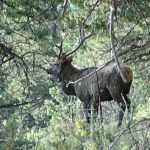 At that time of the year in early bow season, the elk are looking for three things – food, water and females to breed. I start off hunting with my ears. I listen for elk to bugle. Then I try to get in close to the herd. I haven’t had much luck trying to call a herd bull away from his cows. Once I find the herd, I’ll try and move with the herd. I attempt to pick a spot on the edge of the herd where the bull may come. I have set-up over water holes before, but we seem to be the most effective when we locate a herd that has a nice bull with it, and then move with the herd to wherever it’s going. I wear my Mossy Oak camouflage, so the elk can’t see me, and I’m always conscious of the wind. As I move in close to the herd, I make sure the wind is in my face. Then I move slowly and quietly, so the elk can’t hear me, and I don’t get in a hurry. I get as close as I can to the herd. I watch the herd bull to try and determine where he’s going next, and I want to reach that spot before he does. I’ve had bull elk come so close to me that I’ve had to move out of the way to keep them from running over me. When I’m hunting the Gila, I’ll pass-up satellite bulls. I concentrate all my hunting efforts to try and take a herd bull. I’ve passed up quite a few satellite bulls that I could have taken, because I know trophy-size bulls are in the Gila. If I take a satellite bull, I know I won’t get a shot at a herd bull. When I’m trying to sneak in on a herd bull, I will give cow calls. Many times the satellite bulls will come in to within easy bow range of me. When they get downwind of me, they’ll usually spook. But when satellite bulls are spooked, they generally won’t run into the next zip code but rather 40-100 yards. Then they’ll look back to try and figure out what I am. Sometimes they’ll return, and sometimes they won’t. Satellite bulls aren’t like herd bulls. If a herd bull smells you, he’ll get all his cows and run with them, and they very well may run into the next zip code. 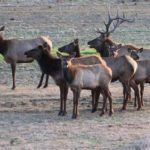 In the 2016 season, I passed up a really-nice satellite bull elk that would score in the 320s. Most archery hunters would have taken that bull. But when I get to hunt the Gila, my goal is to take a bull that will score 350 inches or more. We usually get to hunt the Gila every other year. I put in for a group hunt, which consists of my brother, Calvin, and one of my best friends, Dean Sanchez. I really enjoy hunting with Calvin because he’s my brother, and Dean is like my brother. So, when the three of us go hunting together, we feel more like a family group, and I enjoy being with them. We know how each other hunts. We all hunt the same way. 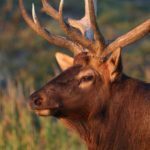 Over the years, we’ve learned that taking an elk is not a one-man hunt. Taking an elk, field dressing, caping and deboning an elk and then carrying all the meat and the trophy out is not a fun time for one man. 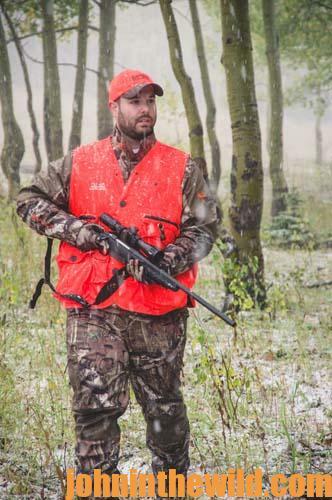 But if you hunt with at least three men like we do, we can get the elk field dressed, skinned and caped, and the meat deboned and packed out most of the time in one trip, without any one of us having to carry too much weight. Each man’s pack will weigh from 85 to about 120 pounds. When we’re packing an elk out and only planning to make one trip, we usually carry two-way radios with us. Then we can let each other know if one of us has an elk down, and where we are, or we’ll plan to meet-up at a certain place at a specific time. If one of us takes an elk, we’ll usually be close enough to each other that he won’t have far to walk to round-up the other two. In 2016, Calvin took a 365-inch bull, which required about 7 hours for us to field dress, debone and pack the meat out. As the crow flies, we were only about 3 miles from our truck. However, we had to go up and down mountains to reach the truck. So, the distance was probably closer to 6 miles, counting the ups and downs. Calvin was hunting by himself. He had given a couple of cow calls. He had gotten close to the herd, and the herd bull came down the mountain to check him out. Calvin actually had a 20-yard shot. But on that shot, his arrow hit the side of a tree on its way to the bull and spooked the bull. 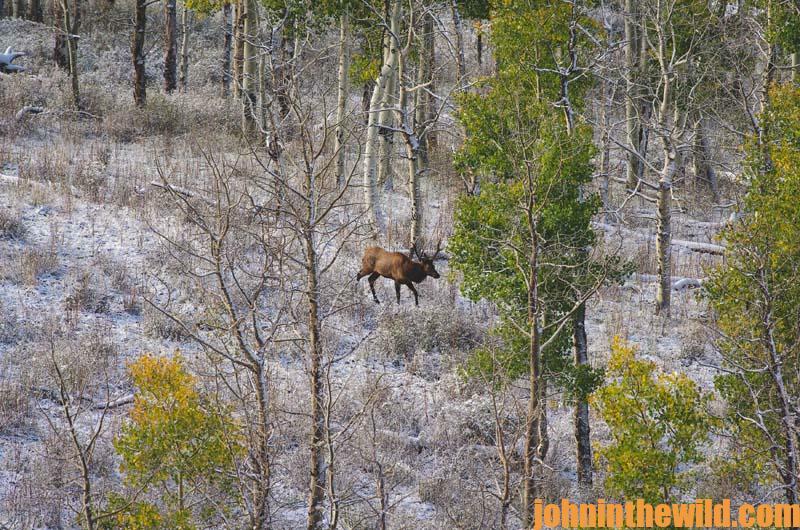 Calvin quickly nocked a second arrow, as the bull ran 29 more yards away from him and turned broadside at 40 yards. Calvin’s arrow entered the bull a couple of inches behind the last rib. He used his two-way radio to call Dean and me to come help him find and get the elk out. We went to look for the elk, but we couldn’t locate the blood trail. The arrow had gone the full length inside of the elk. Some of the tissue it cut blocked the exit hole. If it left any blood at all, we couldn’t see it. Most of the time, Dean, Calvin and I hunt together. If one of us finds a bull we want to take, the other two will sit behind the shooter about 60 yards back and start cow calling. Or, we’ll have two shooters up front, and one of us will get behind them at 60 yards and call. However, we were down to the last day of the hunt. So, we all three split up and went in different directions to try and find an elk to take.